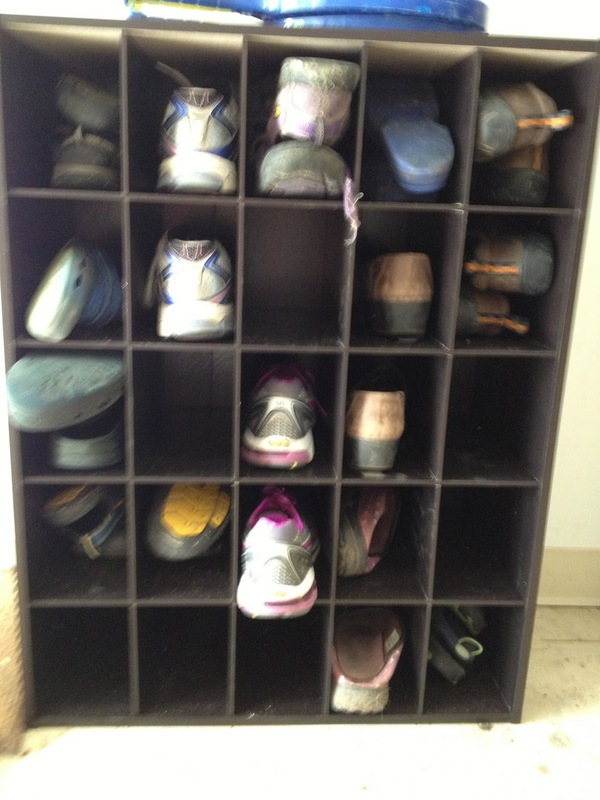 Our family is so guilty of shoe overflow especially in our garage. I am just as guilty as the kids. When I wear out a pair of running shoes, I throw them in the garage and use them as garden shoes. I currently have 3 pairs in there for that purpose. 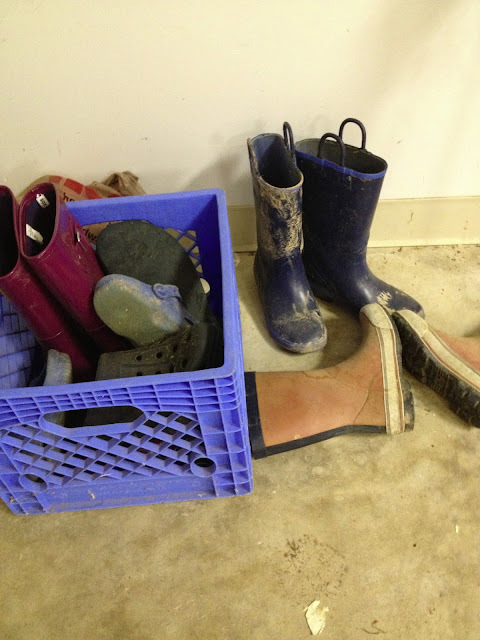 I also save my older sons shoes for my next child, mainly for use in our backyard creek. So how does one take that mess and make it into something you are not embarrassed to have the neighbors see? I was given the opportunity to try out the 25 SHOE CUBE ORGANIZER from ClosetMaid. My husband texted me letting me know he received the package so I put him to work. He took the pictures too:) Turning each family member into a blogger these days. I was gone an hour from when I received the text and I got home. The project was completed. So this is not rocket science folks, just storage solutions. Here are the dimensions of the piece that can be used horizontally or vertically. Just be sure you know which way before you assemble the piece. Here are the dimensions from the Closetmaid Website. I originally thought I would put this in my daughters closet for shoes and sports equipment or our sons’ room to store Lego’s or Playmobile toys. The storage unit gave off an amazing odor that lasted for quite sometime. It is that laminated wood? WOW, we left it in our garage with the door open to help with the smell. The ClosetMaid rep is getting back to me about this. She said it was not normal. Perfect for our garage use, and I chose the dark color to offset the dirt. 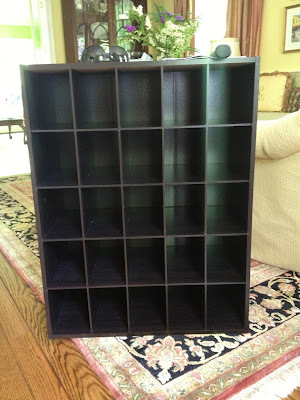 Good improvement from the milk crate we used, you can actually see what you are storing. We did not use it but you can assemble this unit to the wall. 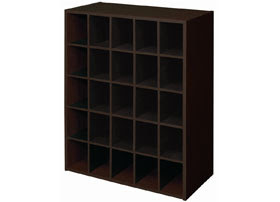 ClosetMaid has many options to help organize your home, office or garage. Learn how to organize your home and gain some great ideas on ClosetMaid’s website, Facebook or Twitter Pages. 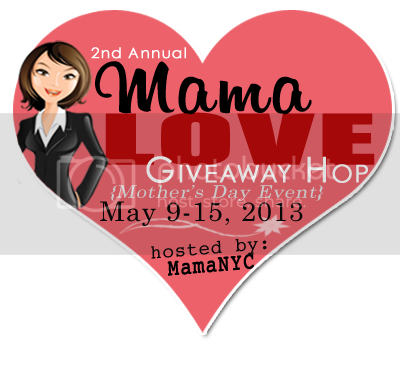 I will be giving away one of these shoe cubes tomorrow in the mother’s day giveaway.